The Federal Risk and Authorization Management Program (FedRAMP) is a government-wide program that provides a standardized approach to security assessment, authorization, and continuous monitoring for cloud products and services. DataBank has a strong pedigree in deploying secure and compliant solutions for mission critical business systems governed by FedRAMP or FISMA requirements. Our team of experts supports the full cycle of your hosting and cloud infrastructure including design, deployment, testing, validation, and defense-in-depth protection. 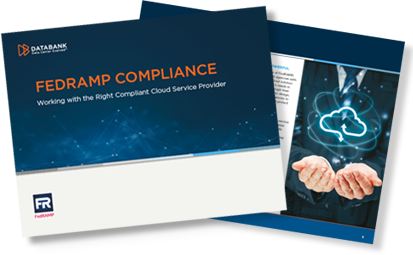 Our mission is to help transform and cloud-enable FedRAMP/NIST compliant workloads to deliver increased agility and predictable pricing while eliminating downtime. Backed by a 24/7 SOC and NOC, we go far beyond the typical IaaS boundaries of the hypervisor, diving deep into the PaaS layer for operating systems, applications, and day-to-day operations. DataBank has undergone a 3PAO audit and validation process utilizing the latest NIST 800-53 security framework and validated the IaaS, PaaS, and comprehensive suite of DataBank NIST compliant security offerings. DataBank’s Authorization to Operate, or ATO, includes traditional and enhanced IaaS and PaaS services. See how we partner with you to design technology solutions that provide a FedRAMP compliant, secure, fault-tolerant environment, ensuring 100% uptime of your data, applications, and computing infrastructure.